America’s Public Bible is under contract with Stanford University Press to be published in their digital publishing program. This version of the site is a prototype created as the first-prize winner of the Chronicling America Data Challenge, sponsored by the National Endowment for the Humanities. The version in preparation for Stanford University Press will include a larger newspaper corpus and take into account more versions of the Bible, as well as the Book of Mormon. Most important, the expanded version will include a peer-reviewed digital monograph interpreting the role of the Bible in American public life through prose and visualizations. For most of its issues in 1902, the Ellensburg [Washington] Dawn featured a quotation from Benjamin Franklin prominently on its front page. “A Bible and a newspaper in every house,” the masthead proclaimed, “are the principal support of virtue, morality, and civil liberty.”1 Though the quotation from Franklin was doubtless spurious, the combination of newspapers and the Bible would have been familiar to readers. Throughout the nineteenth century and into the twentieth century, newspapers in the United States—even newspapers which were not published by a religious denomination or organization—had frequent recourse to the Bible. Newspapers printed sermons and Sunday school lessons, and ministers offered lessons through newspaper Bible clubs.2 Newspapers featured jokes whose punchlines required familiarity with the Bible. They aired political commentary that cited the Bible on all sides of a given issue. They ran features on Thomas Jefferson’s edited Bible and Abraham Lincoln’s use of the Scripture.3 On Good Friday, Easter, and Christmas they reprinted long portions of the Scripture.4 They opined on revisions to the English Bible, and offered word-by-word comparisons of the changes in new translations.5 They made money from advertisements for Bibles of every kind, and some newspapers even sold Bibles directly as a way of raising revenue. But most of all, newspapers quoted the Bible. America’s Public Bible uncovers the presence of biblical quotations in the nearly 11 million newspaper pages in the Library of Congress’s Chronicling America collection. Using the techniques of machine learning I have identified over 866,000 quotations of the Bible or verbal allusions to specific biblical verses on those newspaper pages. For now, the project has looked only for quotations to the King James Version (or Authorized Version) of the English Bible, by far the most commonly used Bible among American Protestants during the nineteenth century.6 For over 1,700 of the most frequently quoted verses, this site offers a way to explore the trend in how frequently a biblical verse was used, with links to each quotation highlighted in the pages of Chronicling America. The site thus uncovers two contexts for each verse: the context of the newspaper article in which it was used, and the broader chronological context of quotations from that verse and the Bible as a whole. An advertisement for The Illuminated Holy Bible, which several newspapers sold directly. From the Brattleboro Daily Reformer (Brattleboro, Vt.), 15 Nov. 1916. This article retells the parable of the good Samaritan (Luke 10:30–36), reinterpreting it with the Populist movement as the Samaritan. From the Owingsville Outlook (Owingsville, Ky.), 2 March 1899. America’s Public Bible brings together two strands of scholarship. On the one hand, its methodology is drawn from recent digital humanities projects which are concerned with tracking the reuse of texts. On the other hand, it draws on a deep scholarly literature on the Bible as a cultural text in American life. The Bible included tens of thousands of texts, each of which could be interpreted in many ways. The contribution this site makes is to show how thousands of biblical verses were used over nearly a century in some 56 billion words of text, revealing trends that are inaccessible to a single scholar’s reading of these documents, yet enabling a close reading of the ways in which verses were put to use. For many Americans the Bible was a text whose meaning was self-evident, yet the Bible’s role in U.S. history cannot be understood apart from the ways that Americans actually put it to use. That is why I have called this site America’s Public Bible. By looking at uses of the Bible in newspapers, we can see which parts of the Bible were in common currency among Americans, as well as the range of interpretations that were given to those verses. Verses that could be cited without a reference (or used in jokes) indicated a kind of literacy or familiarity, and possibly a shared assumption about what those verses could be interpreted to mean. Verses that were used constantly were a shared cultural touchstone, while verses that were used only episodically reveal the tensions in a particular political or social situation. By looking at how the verses were actually used, we can see how the Bible was a contested yet common text. The most popular verse in these newspapers was “Suffer little children to come unto me, and forbid them not: for of such is the kingdom of God” (Luke 18:16; cf. Matthew 19:14, Mark 10:14). The American Sunday school movement made this verse popular, as organizations like the American Sunday School Union and denominational Sunday schools published Sunday school lessons weekly in the newspapers. This verse peaked in the 1850s, during a formative period for the Sunday school movement.9 The verse “[God] hath made of one blood all nations of men” (Acts 17:26) was a crucial text with which American Christians thought about race and slavery, especially since it was a proof text for the unity of human beings regardless of race. The verse also spoke to scientific debates about monogenesis versus polygenesis (the question of whether have a single or multiple origin). This verse peaked in the middle of the Civil War.10 While scholars have often discussed the origins of Christian nationalism, newspapers quoted verses association with nationalism relatively infrequently compared to other texts. 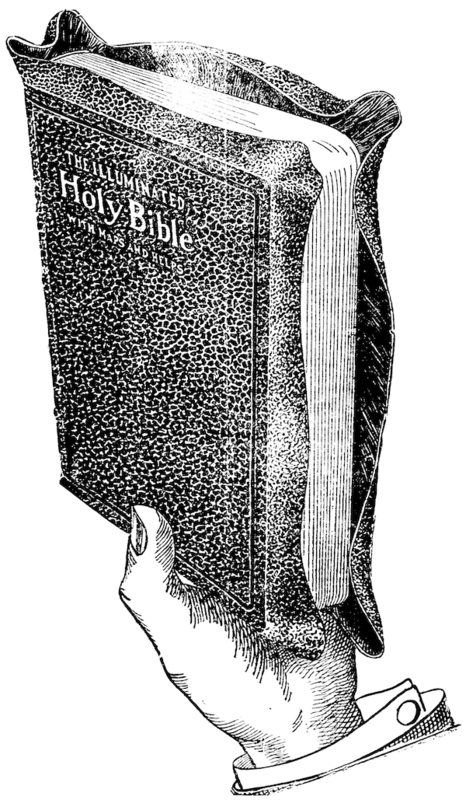 An exception was the text “Righteousness exalteth a nation: but sin is a reproach to any people” (Proverbs 14:34), which was the subject of fast day sermons and other jeremiads during the Civil War.11 While many verses declined in popularity over time, one verse that grew in popularity at the beginning of the twentieth century was John 15:13: “Greater love hath no man than this, that a man lay down his life for his friends.” This verse was frequently used to memorialize the dead, especially when they were associated with heroism. While the verse was used after the Civil War and for victims of a yellow fever epidemic in the Mississippi River valley and Memphis in 1879–80, it peaked when memorializing the dead of the Great War.12 Finally, 1 Samuel 3:4 was scarcely ever quoted in American newspapers, with the exception of 1876, when presidential candidate Samuel Tilden adopted “The Lord called Samuel” as his motto. 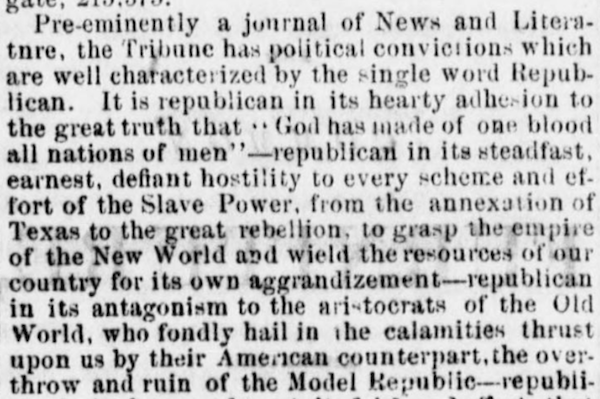 The New York Tribune identified itself as Republican and anti-slavery by quoting Acts 17:26. Other newspapers reprinted this notice. 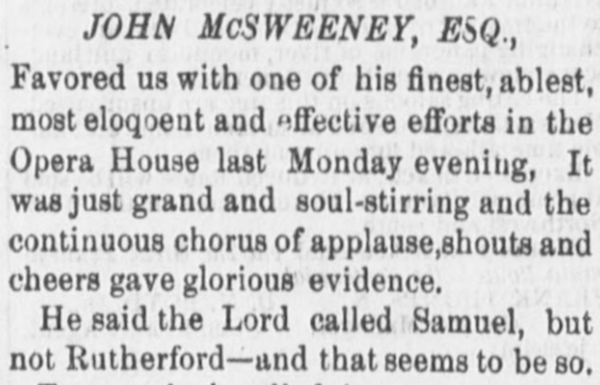 From the Lamoille Newsdealer (Hyde Park, Vt.), 18 Dec. 1862. Democratic newspapers quoted 1 Samuel 3:4 supporting Samuel J. Tilden against Rutherford B. Hayes in the 1876 presidential election. 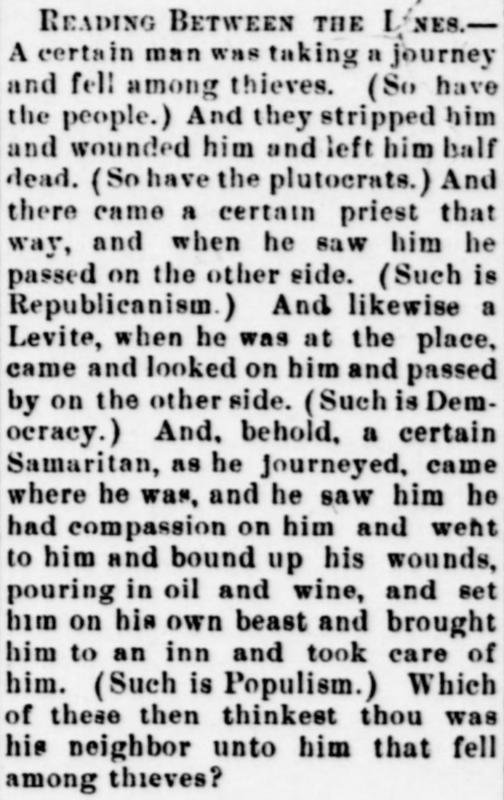 From the Stark County Democrat (Canton, Ohio), 09 Nov. 1876. 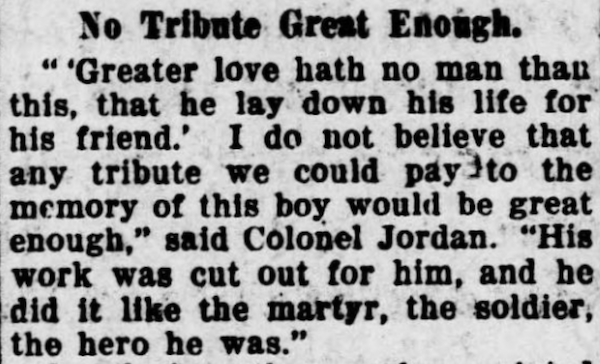 A memorial to an Rock Island, Illinois, soldier who died in World War I after saving other soldiers in a mustard gas attack, quoting John 15:13. From the Rock Island Argus (Rock Island, Ill.), 14 Nov. 1919. There are three things that you can do on this site. First, you can use the main exploratory graphic to investigate the trends in how different verses were quoted, and to find links back to Chronicling America for each quotation. Second, the topics and verses page offers several visualizations, tables, and brief essays on specific topics or verses. And finally the sources and methods section explains how I found the quotations. There you can also find links to the code I wrote and a download of all the quotations used in this site. If you use this project for academic work, here is a suggested citation. Lincoln Mullen, America’s Public Bible: Biblical Quotations in U.S. Newspapers, website, code, and datasets (2016): <http://americaspublicbible.org>. January 4, 2018: This site was presented in a paper titled “How 19th-Century Americans Quoted Their Bibles” for the panel “The Digital History of 19th-Century U.S. Religion,” co-sponsored by the American Society of Church History and the American Historical Association. February 27, 2017: A much expanded version of this site will be published as a digital monograph by Stanford University Press. July 25, 2016: This project won first place in the National Endowment for the Humanities’ Chronicling America Data Challenge. June 13, 2016: Initial release of the website and data. Add feature to let users classify matches as accurate or inaccurate, so that this labeled data can be used to improve the model results. Extend the model to other English language versions of the Bible (American Standard Version, Douay-Rheims version, Apocrypha). Extent the model to non-English language versions of the Bible (German Luther Bible). Extend the model to the Book of Mormon. Improve model accuracy with additional training data from users of this website. Time series analysis on the trends for verses, including seasonality and clustering. America’s Public Bible: Biblical Quotations in U.S. Newspapers by Lincoln Mullen <lincoln@lincolnmullen.com>. This website and its associated code and data are copyright © 2016. All data and code is licensed under the terms of the MIT license. For now, the text and visualizations remain temporarily copyrighted until I settle on a long-term plan for publishing this research.